Saving for higher education expenses is a major financial goal for many families. Remember it is always cheaper to save now rather than borrowing later. In most cases the Nebraska 529 plan is the best way for residents to save for the cost of higher education. A 529 Plan is named after part of the tax code that allows states to set up a tax deferred savings plan. You can use the savings and earnings within the 529 to pay for qualified educational expenses. This includes college, community college, graduate school or trade schools including on-line courses. As of last year you can also use the money for certain technology items like computers and printers. Each state has one or more 529 plans. Nebraska happens to have a great direct 529 plan. Go to www.nest529direct.com. If you just go to your local broker or “financial advisor” you might get their canned plan that they sell and it will probably be with another state. You should use a Nebraska 529 plan because Nebraska is one of the states that have up to a $10,000 state tax deduction. But only if you are a resident of the state, use Nebraska’s 529 plan and are the owner of the account. It doesn’t matter what 529 plan you use, the money can be used anywhere for qualified educational expenses. If you roll another states 529 plan into the Nebraska plan you are eligible to receive the tax benefit. The person who sets up the 529 account is the owner and they control the account and name a beneficiary. The beneficiary can be a child, grandchild, niece, nephew, friend or even yourself as long as the money is to be used for higher education. You name a successor owner when you set up the account and you can change the beneficiary later if you wish. When the beneficiary gets closer to college age this may become important because federal student aid eligibility depends on who owns income and the assets. To get federal student aid you must fill out the Free Application for Federal Student Aid form commonly known as the FAFSA and renew it each year. This form is to determine the students “expected family contribution” (EFC) toward higher education. Each year 50% of a student’s income and up to 20% of their assets are counted as available to pay educational expenses. 47% of the parent’s income and 5.64% of their assets are also counted. So assets in the students name like UTMA/UGMA accounts are not as good for federal student aid purposes as a 529 in their parents or grandparents name would be. You cannot convert a UTMA/UGMA account to a 529 without first paying the taxes on any gains in the account, but it may make sense in certain situations. If the parent owns the 529 only 5.64% of the account is counted for EFC purposes. If a grandparent owns the account any distributions from the account for the grandchild is counted as income for the student for next years’ EFC calculation. So it takes some planning and at some point if the 529 is in a grandparent’s name you might want to switch owners from grandparent to parent depending on your situation. If you have multiple children or grandchildren do you set up one account for everyone or separate accounts? 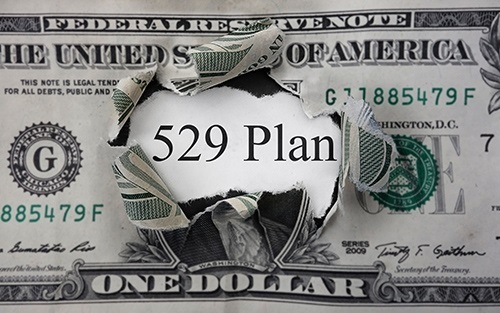 Unless you have beneficiaries that are not ever going to be using money at the same time set up separate 529’s. The Nebraska 529 plan makes it easy for family and friends to contribute to a child’s 529 account. The account owner gets a code they can give out in person, by phone, by email or even on social media. The donor goes to the Nebraska 529 website with the code where they can make a contribution to the beneficiary by check or online. They can also print out a gift certificate or a special card to give the recipient. What happens if no one uses the money in the 529 or if the beneficiary gets scholarships? The worst case is that if you don’t use the money for qualified educational expenses you can cash out the account and pay a 10% penalty and taxes on any earnings in the account. But you have a lot of other options. You can change beneficiaries, or be creative and use it yourself. You can also just keep it going and create a legacy for grand children or greatgrandchildren who haven’t even been born yet. If the beneficiary gets scholarships or is appointed to a military academy you can take penalty free withdrawals up to the amount of the scholarship but any earnings are taxable.